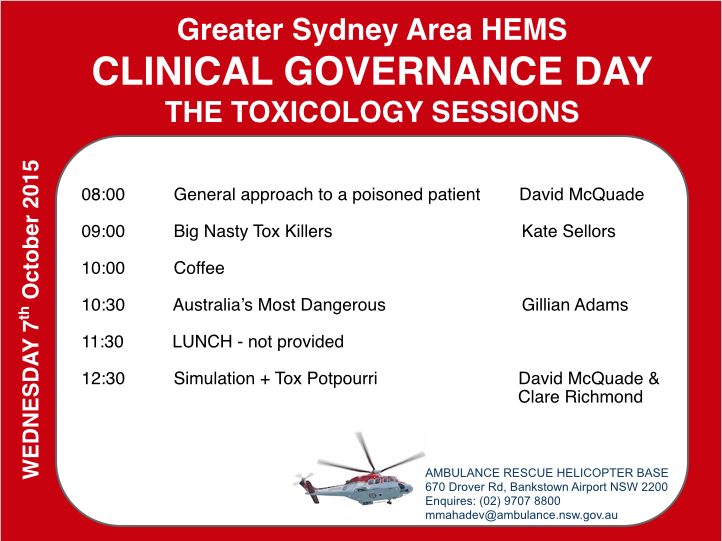 The next Sydney HEMS Clinical Governance Day is coming up next Wednesday, October 7th at Bankstown with a full day devoted to overdose, envenomation & all things TOXICOLOGY !! We are fortunate enough to have Dr Kate Sellors return to Bankstown. Kate is a former Sydney HEMS colleague and an Emergency Physician from Prince of Wales Hospital with a special interest in Clinical Toxicologist. Throughout the day we will be looking at a general approach to a poisoned patient, learning the ins and outs of the major toxicologic killers (including beta-blockers, calcium-channel blockers & TCAs) as well as being schooled in the killer creepy-crawlies that inhabit Australia !! This day should not be missed…. Prior to the CGD, it would be worth reading over a few of the attached papers/blogs to enhance our learning on the day! Big Tox Killers in Overdose (CCBs, TCAs, BBs). Demonstration video on applying a PIB. All NSW Health staff welcome, sign-in required. See here for directions. This entry was posted in training and tagged CGD, toxicology. Bookmark the permalink.